The average cost of assisted living in Zephyrhills is $2,790 per month. This is lower than the national median of $3,346. To help you with your search, browse the 28 reviews below for assisted living facilities in Zephyrhills. On average, consumers rate assisted living in Zephyrhills 3.9 out of 5 stars. Better rated regions include Wesley Chapel with an average rating of 4.0 out of 5 stars. Caring.com has helped thousands of families find high-quality senior care. To speak with one of our Family Advisors about assisted living options and costs in Zephyrhills, call (855) 863-8283. Located in west-central Florida, about 30 miles northeast of Tampa is the suburban city of Zephyrhills, known for its pristine spring water. Zephyrhills is also home to seven assisted living facilities for seniors in need of some help with activities of daily living, such as taking medications, getting dressed and personal hygiene. Some licensed facilities offer services that go beyond basic assistance for elders who may need more supervision or limited nursing care. With frequent summertime thunderstorms, Zephyrhills's annual rainfall exceeds the national average by about a third. Summers are humid with average highs frequently passing 90 degrees. The winter months are mild and short with lows in the upper 40s and 50s, although daytime temps often reach the 60s and 70s. Sales tax in Zephyrhills is 7 percent on most purchases, but the state doesn't tax income, including social security benefits and pensions. The cost of living in Zephyrhills is over 16 percent lower than the national average. For those on a budget, the lack of income tax and lower cost of living may help seniors save money. With 3.42 violent crimes per 1,000 residents per year, Zephyrhills' crime rate is lower than the state and national averages. Most of the crime occurs in the city's center and southeast area. Pasco County, home to Zephyrhills, received a B from the American Lung Association due to its fairly low number of high-ozone days, which is good news for seniors with respiratory illnesses. Too much ozone in the air can exacerbate respiratory conditions. The Zephyrhills area is home to world-class medical facilities, including Tampa General Hospital and the James A. Haley Veterans' Hospital, in the event of medical emergencies or illness. Assisted Living costs in Zephyrhills start around $2,790 per month on average, while the nationwide average cost of assisted living is $4,000 per month, according to the latest figures from Genworth’s Cost of Care Survey. It’s important to note that assisted living rates in Zephyrhills and the surrounding suburbs can vary widely based on factors such as location, the level of care needed, apartment size and the types of amenities offered at each community. 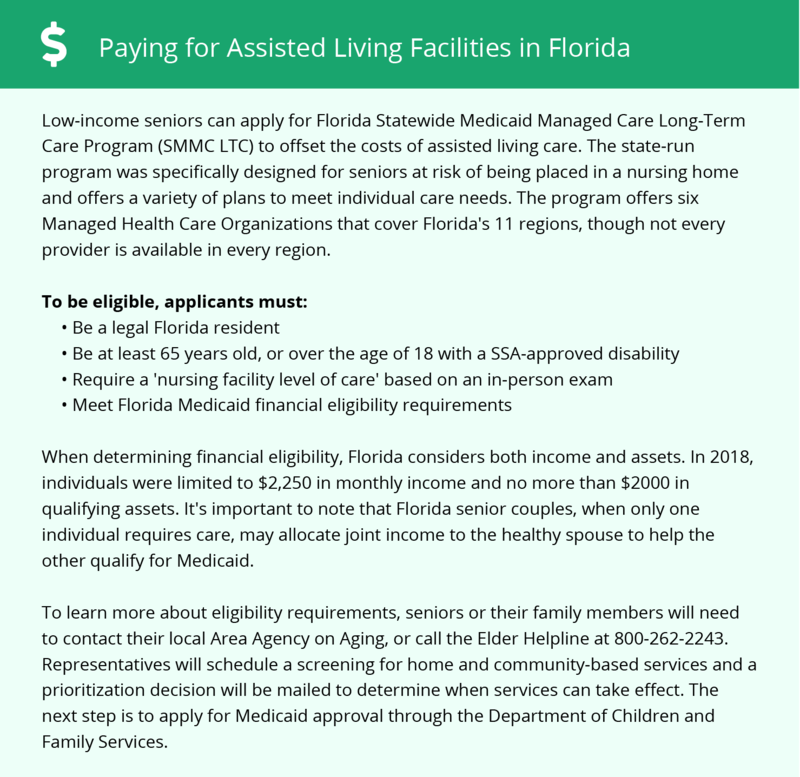 Florida offers optional state supplementation (OSS) to seniors who receive Federal SSI benefits that can help with the cost of the assisted living. The state also has Medicaid Long-Term Care (MLTC) and Assistive Care Services programs that cover the cost of services at assisted living facilities for eligible participants. The state doesn't cap room-and-board fees for program members, but MLTC does negotiate prices on behalf of participants. The state also allows certain methods of family supplementation that don't affect a senior's Medicaid eligibility. Zephyrhills and the surrounding area are home to numerous government agencies and non-profit organizations offering help for seniors searching for or currently residing in an assisted living community. These organizations can also provide assistance in a number of other eldercare services such as geriatric care management, elder law advice, estate planning, finding home care and health and wellness programs. To see a list of free assisted living resources in Zephyrhills, please visit our Assisted Living in Florida page. Zephyrhills-area assisted living communities must adhere to the comprehensive set of state laws and regulations that all assisted living communities in Florida are required to follow. Visit our Assisted Living in Florida page for more information about these laws.